Our Monster Cooling series radiators cater towards enthusiasts with engines that have been heavily modified and produce far more horsepower than they did when they were stock. These radiators have four rows of 11/16“ tubes, and the core is approximately 2 3/4” thick. These radiators are built with brazed aluminum tubes tig-welded to aluminum tanks, about 10-12 louvered fins per inch, a brass petcock, and all are designed with aircraft grade aluminum. Our Monster Cooling series four-rows are designed for the serious enthusiasts running highly-modified engines. The oversized tanks, along with a fourth row of tubes, provide maximum coolant capacity and heat-exchange surface. Due to the fact that these radiators are maximum sized, slight modification of mounting saddles may be required, particularly if the stock radiator you are replacing was not a factory four-row. The Monster Cooling series radiators are typically recommended for applications with 800-1200+ horsepower. 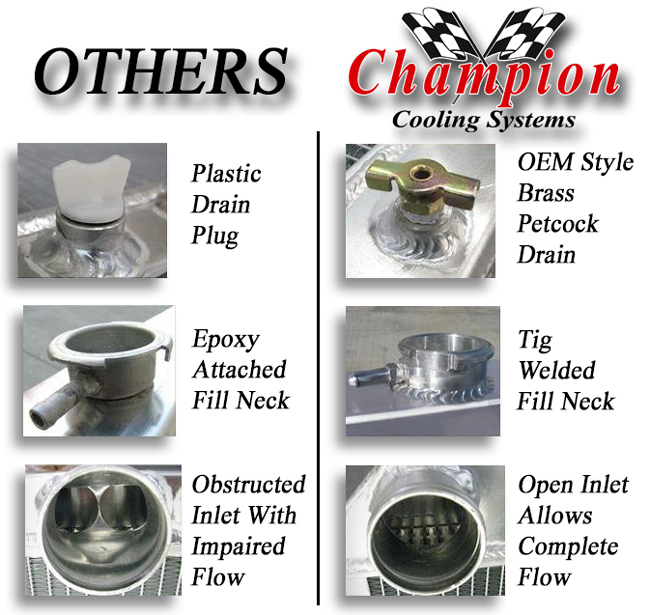 Champion Cooling brought the Monster Cooling series of radiators to market with the goal of not only making a product our customers would be proud to show off, but also designed to the highest standard while still making it very affordable. You could easily spend between $600 and $1300 on a comparable four-row radiator from one of our competitors. We have an amazing customer service team available by phone or by email, so if you have any questions, please feel free to give us a call.